For those who value high-quality meats, going to the grocery store just won’t cut it. Instead, heading to your local butcher will yield a much better experience during both shopping for meats and eating whatever delicious dish it is used in. If you’ve never experienced the benefits of a full-service butcher, here are just some of the advantages over the average meat section in a supermarket. While stopping by a supermarket might be acceptable for some meats when you’re in a pinch, the quality and purity of the product pale in comparison to a full-service butcher. The packaged meat may actually come from several different animals and, while rare, sometimes includes meat from different sources thanks to errors in the processing plant. 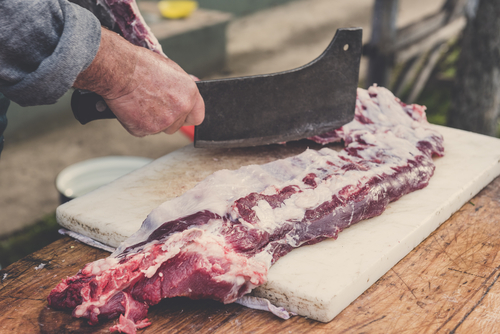 A full-service butcher, on the other hand, knows the source of each piece of meat and can give you specific information, such as where the animal was raised and the exact location of the cut. You’re getting a much more controlled and quality piece of produce. A full-service butcher understands how important proper animal care is not just for the quality of meats, but for the respect and humanity of the creature as well. A butcher will typically choose farms that raise their animals in humane and natural conditions, forgoing artificial growth enhancements and steroid use. This passion for the product starts at the sourcing but extends all the way to the kitchen. If you’re curious about how to prepare a certain cut of meat, your butcher can give you tips. Even better, you may also be able to get some amazing recipe ideas from the butcher’s staff. Having this interaction is much better than simply picking up a package of processed meat and then searching the internet for a recipe. Spending a dollar at the huge supermarket down the street does nothing to bolster your local economy. Supporting your local full-service butcher, however, puts money into your local economy and keeps smaller businesses thriving. Also, this benefit typically comes with just a small price increase from the supermarket meat. The Butcher & Bird is the go-to source for high-quality meat in Honolulu, HI. The shop regularly sources from various outer-island farmers, showing a commitment to gorgeous and natural produce and a passion for the local business economy. For more information, call (808) 762-8095 or visit their website today.